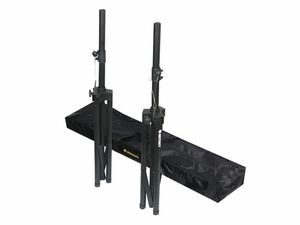 The LTS2X2B Speaker Stand Pack comes with two Speaker stands and carrying bag for easy transport. 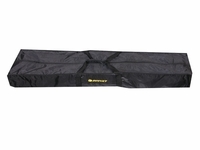 Each Stand holds up to 120 pounds and extends to a height of up to 8 feet. The Extension pole includes a built-in system that locks at the highest point so you don't have to worry about over extending the pole and cause the mounted speaker to fall. Tripod also features folding legs and non-slip rubber feet. � Speaker diameter pole is 1-3/8"